Haiti was Latin America's first independent nation. It is also the poorest country in the Western Hemisphere. A boy stands in a flooded field after Hurricane Ernesto passed through the region in 2006. ((Ariana Cubillos/Associated Press))Even before the Jan. 12 earthquake rocked Haiti, it was a nation of hopelessness and despair. Yet a little more than two centuries ago, Haiti had inspired hope for many when it became the world's first independent black republic. The tragedy of Haiti — which, along with the Dominican Republic, makes up the island of Hispaniola — begins with Christopher Columbus's first voyage to the Americas. Estimates of the island's population, the Taino, at that moment are as high as eight million. Eighteen years later, the native population was about 50,000. Historian Moreau de Saint-Méry wrote in the 18th century that "there remained not a single Indian when the French came to wrest the island from the Spanish" in the second half of the 17th century. In 1697, Spain formally ceded the western third of the island to the French, who named the territory Saint-Domingue. The French turned the colony into a plantation economy, powered by slave labour. "By 1789, the colony supplied three-fourths of the world's sugar," Paul Farmer, now the deputy UN envoy to Haiti, writes in The Uses of Haiti. Around then, 29,000 African slaves were arriving in Haiti every year. The wealth Haiti generated for France was enormous. Farmer writes that in 1776, it was generating "more revenue than all 13 North American colonies combined." But that wealth brought unspeakable horror for the slaves that produced it. One third died within three years of their arrival. In 1794, the slave uprising began. Ten years later, the French had been routed and the new leaders reclaimed the island's Indian name. According to Farmer, it is the only example of "an enslaved people breaking its own chains and using military might to defeat a powerful colonial power." Independent Haiti started with a devastated economy and infrastructure as well as the hostility of much of the rest of the world's rulers. The U.S. and Europe isolated Haiti. Soon it was an era of gunboat diplomacy, with Germany, France, England and the U.S. sending ships into Haitian waters to enforce their demands. By 1914, when the U.S. starting maintaining ships in Haiti "almost without interruption," its navy had already sent warships at least 30 times since 1849, according to American military historians. From 1915 to 1934, the U.S. occupied Haiti. After the Americans left, 12 years of repressive stability followed. Then a period marked by military coups culminated in the army's installing Dr. François Duvalier in 1957. "Papa Doc," Haiti's "President for Life," and his son Jean-Claude (known as "Baby Doc") would rule Haiti until protests forced the latter dictator to flee in 1986. In 1982 a Canadian parliamentary committee had described their rule as a "kleptocracy." The military took over and ruled Haiti, except for a few months, until 1990. Elections took place in December and Rev. Jean-Bertrand Aristide, a left-wing priest, won an overwhelming victory in the presidential vote, on the shoulders of the opposition movement against military rule. But after just seven months the military staged another bloody coup, and Aristide soon went into exile. This coup met with strong international and popular opposition. Three years of contested power followed until Haiti was occupied by a multinational force that consisted almost entirely of U.S. troops. Aristide resumed his presidency in October 1994. The next year, authority was transferred from the multinational force to the UN mission in Haiti, with significant Canadian involvement until it ended in 1996. Aristide's term also ended in 1996 and his candidate then took over. Aristide was again elected president during a contentious vote in 2000. Through all this time, Haiti was marked by violence, instability, poverty and corruption. Opposition to Aristide continued to grow. By early 2004, the opposition was in military control of a large part of Haiti. Aristide was forced from power in February; he said he was kidnapped by the U.S.
A multinational interim force with eventually 3,600 troops was formed. Canada again played a major role. 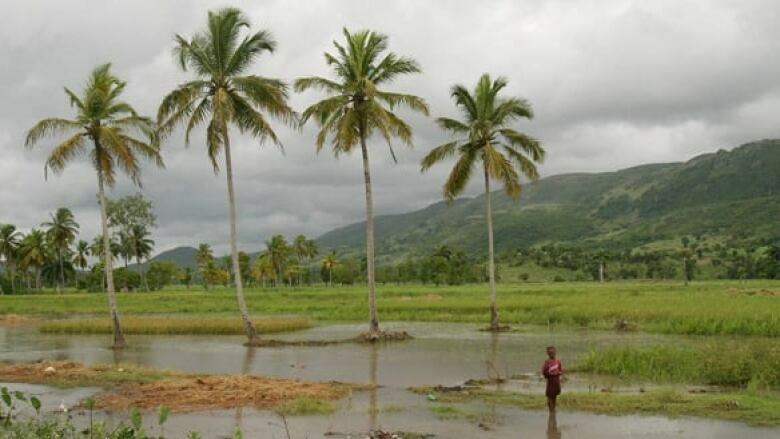 That year, floods in May and September claimed 5,000 Haitian lives. Others died in the continuing political violence. In 2008, Haiti was once again devastated, this time by storms and hurricanes. At least 800 people died and a million were left homeless. A humanitarian crisis followed. On the timeline, clicking on a dot or an event title brings up a description of the event. Right-clicking on a link in a description opens the link in a new window/tab. The sliders on the bottom expand or contract a time period.